Reports include data on sends, deliverability, total and average opens, total and average clicks, page views, unique page views, and video loads (if applicable). 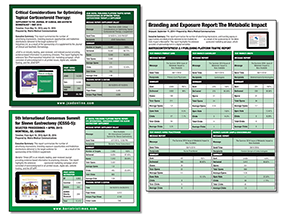 NPI level data is available: for any programs that include a list match, we can provide the user-level data for your matched targets. MMC will also provide monthly analytics on the entire campaign tied to pre-determined and agreed-upon Key Performance Indicators. MMC will meet to analyze and re-evaluate all tactics on a quarterly basis and can adjust the campaign in order to maximize performance throughout the year. MMC is committed to delivering programs of the highest value to our clients. We can work with your analytics team or an independent third party to determine ROI, script lift, reach, and other key performance indicators. 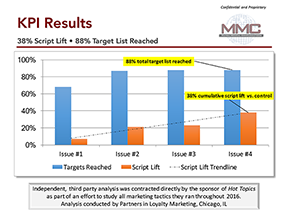 A recent analysis showing 38% script lift was achieved with a program run through Matrix Content Xpress. Contact us to receive a copy of the study.